Lakes and ponds are areas of permanent or near permanent standing water with minimal flow. Beaver ponds and ponds that occur in glacial “kettle” holes are natural examples of these habitats. 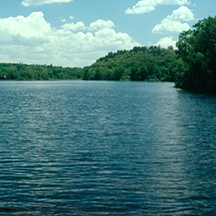 Naturally occurring lakes and ponds are referred to as “Great Ponds.” Most lakes and ponds in Massachusetts are not naturally occurring. There are many impoundments and dug ponds throughout the state and most lakes were created by dams. Nationwide, lakes and ponds are the only category of wetland? that has increased over time.